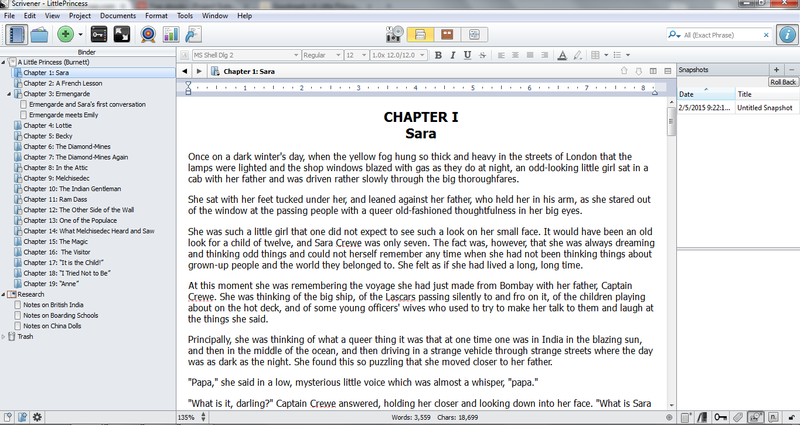 Note: If you’re interested in taking a look at the writing program Scrivener for yourself, it’s available here. When I started taking writing classes at the San Francisco Writing Salon several years ago, one of my instructors suggested that her students try out a program called Scrivener. She praised its flexibility and multiple editing modes, and promised that it was reasonably priced and easy to learn, but I was still skeptical, for much the same reason I’m skeptical of any new writing tool. I’ve been writing since I was five years old; for most of that time, I used nothing but a basic word processor or pen and paper. I thought the bells and whistles of a writing-focused program would just be a distraction. But the program kept skittering across my writer radar, and so just before New Year’s 2013, I took the bait and went to the website for a look. And I’ve never looked back. At the most basic level, Scrivener functions like a giant virtual binder, giving you the capacity to reference all the parts of your project in one place through folders, subfolders and files. 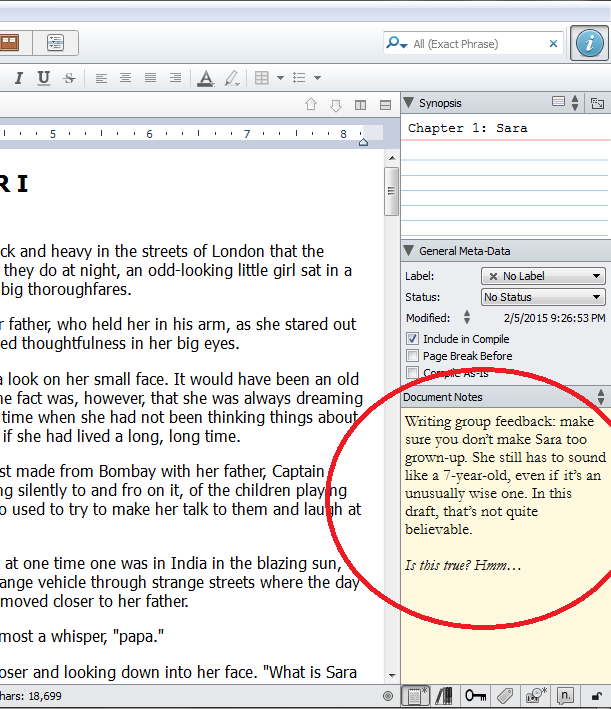 You can import text documents that you’ve composed in other programs; you can also compose directly in Scrivener itself. What you might see when you opened your Scrivener project, if you were Frances Hodgson Burnett writing A Little Princess. This is probably a good place to note that because I don’t consider my current project ready for prime time, to illustrate aspects of the program I’m including screen shots from a different text: for those who don’t recognize it straightaway, it’s Frances Hodgson Burnett’s A Little Princess, which I obtained through Project Gutenberg. In integrating my massive book into Scrivener, I’ve opted to parse things so that each scene is a unique file, grouped together in folders by chapter; but I’ve also sorted my chapters into larger folders encompassing Draft 1 and Draft 2. Within the same document, I also have folders for Book 2 and 3 of my trilogy, with subfolders to break them down by chapter and scene. In practice, this means that when I get a brainstorm about something that won’t happen for 2½ books, I can go to the appropriate place, scrawl it down, and be confident that it’ll sit there until I’m ready to write the relevant scene. And because of the program’s flexibility, I can shift with a click from viewing a single scene to viewing a whole chapter or even the whole book. This, to me, still seems a little bit like magic. Snapshots. What my programmer husband would call versioning software. When I’m finished with a scene for the day, I push a button and Scrivener saves a copy of it; the next time I sit down, I can joyfully tear the whole thing out by the roots if I’m so inclined, because anything I might want to retrieve from the dustbin will be sitting quietly in the Snapshot folder waiting to be resurrected. Outline Mode. Probably the feature that’s been most useful to me in my efforts to plot this giant series, this option allows me to view chapters and scenes in a clean, bullet-pointed mode. 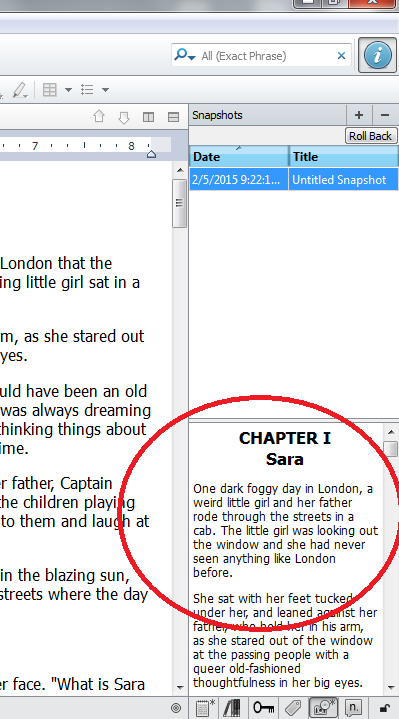 I can fill in a one- or two-sentence synopsis of each scene and chapter. And if I decide I want to change the plot, or shuffle chapters or scenes, all I have to do is click and drag and the associated notes and prose will move to the new location right along with the title. Split Screen Capabilities. 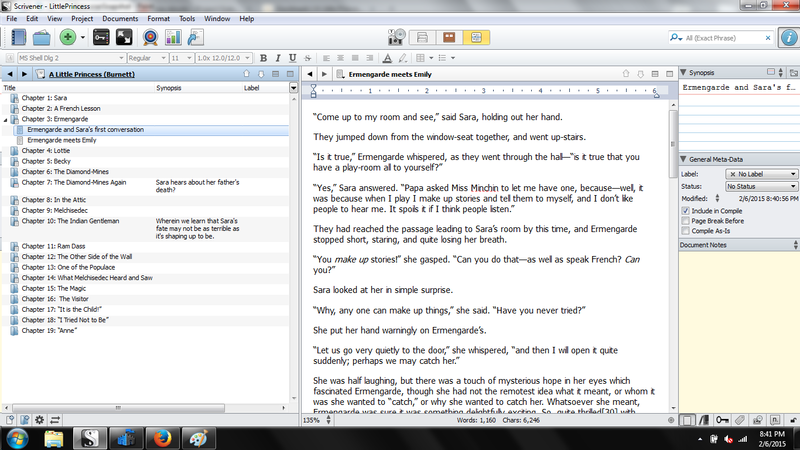 Many programs (including MS Word) allow you to have multiple versions of the same document open at once; Scrivener also lets you have two files open simultaneously, so you can cross-reference between scenes or (as I did for two months) have your timeline open on the side while you’re composing the grand history of your setting. Word Count, Project & Session Targets. The word count for the file you’ve selected (whether it’s a scene or the whole book) appears as a default in the footer of the program. You can also set targets for each writing session and for the project overall, and bring both of those up on screen with one keystroke. Manuscript Formatting. When you’re done with your draft (or want to send something to a writing group), select which parts of your document you want to export and the format you want them in, and Scrivener will take care of the rest. There also are a pile of other small friendly things that make it clear this is a program designed by writers for writers, like the capacity to take your work in progress full-screen with a single keystroke, or to open a long document at the start of your writing day and find yourself in the same paragraph where you left off (in the old days, I would mark my stopping place with “Stopped here” so I could search for that keyword instead of scrolling through 40+ pages). Scrivener bills itself as a program for getting the first draft done, but my first draft is in the bag at this point, and I’m still using it. So if you’re a writer of big books looking for a compact, affordable toolkit to streamline your writing process, you might want to check this one out.